In the 2011 Census, two of the table types that were produced were ‘Local Characteristics’ and ‘Detailed Characteristics’. Local Characteristics provided slightly less detail for smaller areas. Detailed Characteristics provided slightly more detail for larger areas. The level of detail included in Detailed Characteristics tables meant that, to prevent disclosure of individuals’ information, these tables were only produced for areas that had minimum population thresholds of 1,000 persons or 400 households at Ward level. Some areas fell below these thresholds. In these cases, the area was merged with a neighbouring area (or areas) until the combined Census estimate for the merged areas was above both the minimum person (1,000) and household (400) thresholds. Therefore, Detailed Characteristics were produced for areas known as 2011 Census Merged Geographies. The complete set of 2011 Census Merged Geographies included both those that had been merged, as well as those areas above the threshold that did not need to be merged. This gave complete coverage of England and Wales. It is important to note that because the ONS were technically creating new areas, the entirety of England and Wales had to be covered. This meant that a brand-new geography was created. These geographies started with the characters E41 and W40 for Local Authorities and E36 and W39 for Wards in England and Wales respectively. The outcome is that for geographies that weren’t merged, they are directly comparable between the Detailed Characteristics and Local Characteristics codes, e.g. 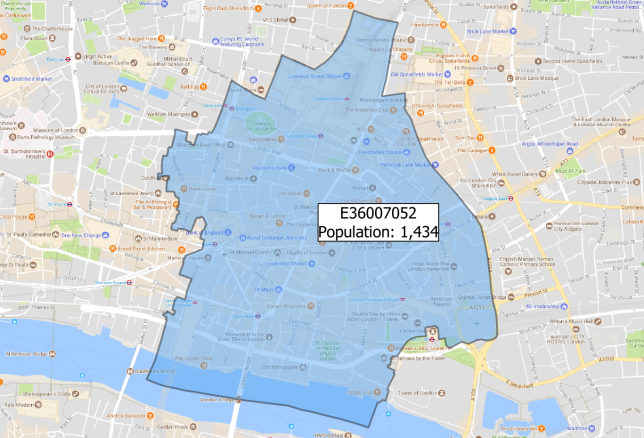 E05002422 – East Brighton has the exact same population and boundaries as E36000975 – East Brighton. Here is an example, which might help explain further. 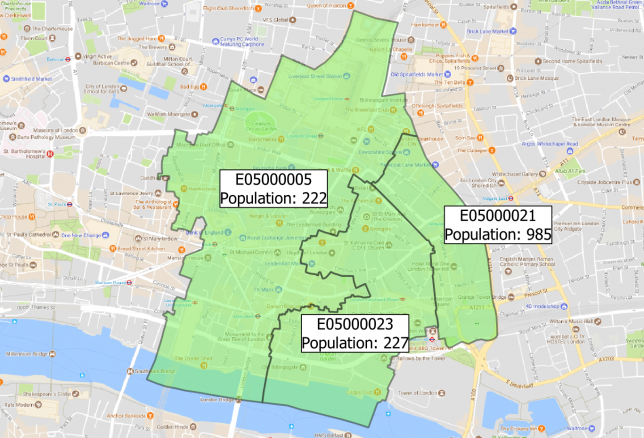 Here, the three areas in London (Bishopsgate, Tower and Portsoken) all have person populations that fall below the minimum required threshold of 1,000. This means that only the lower level detail Local Characteristics tables were produced for them. Producing Detailed Characteristics tables for these areas would be too disclosive meaning that individuals could be identified. By treating the three areas as a single Merged Geography, the person population then goes up to 1,434, meaning it passes the threshold of 1,000. This means that any Detailed Characteristics tables reporting these Merged Geography figures will not be too disclosive. The geographies affected were Local Authorities in England and Wards and Electoral Divisions in England and Wales. More information can be found on the ONS Geography page.